All workshops, courses and events are governed by following terms and conditions which are in additions to any specific terms that may have been given in product brochure or elsewhere. By enrolling into the course, it is deemed that the participant has read and agrees to the GTC. The participant has read the course contents, eligibility conditions and terms of the event contained herein and has satisfied himself or herself about the applicability and fitment for individual’s requirement. CDIMS does not verify the pre-qualifications and hence will not be responsible for any mis/judgement on part of the participants to enrol for the course. The course content may be changed at discretion of the CDIMS to enable changes in profession or business environment or to cater to majority needs of the participants. All courses can be changed without notice. It is mandatory to make the full payment in order to book your seat. All bookings even if confirmed in writing shall be subject to actual payment of fees. Unless and otherwise specifically stated or agreed in advance, all payments made are non-refundable. In any specific case, there may be need to cancel the booking in which case the refund if any shall be at the sole discretion of CDIMS. This shall be considered before the event date and on a written application by the participant giving full particulars of the reasons with relevant supporting. If CDIMS finds merit in the case, the fees shall be refunded subject to actual receipt of the fees by CDIMS and participants giving proof thereof. Without assigning any reasons CDIMS reserves the right to refuse admission if (a)payment is not received on time or (b) the eligibility conditions are not met or (c) CDIMS considers the participant not fit for the event for any reason whatsoever. Replacement shall also follow the same rules as stated above and shall be allowed at sole discretion of CDIMS. For reasons not within control of CDIMS or in case of non-enrollment of minimum number of participants, the event may be cancelled or postponed. In case of postponement, a choice shall be allowed to the participants to be responded within three days in writing for acceptance of renewed dates. In case of no response, it will be deemed that the participant agrees to the postponed dates/timings/venue. In case of cancellation as aforesaid the fees received shall be returned back. 9. All refunds shall take a processing time of four weeks. 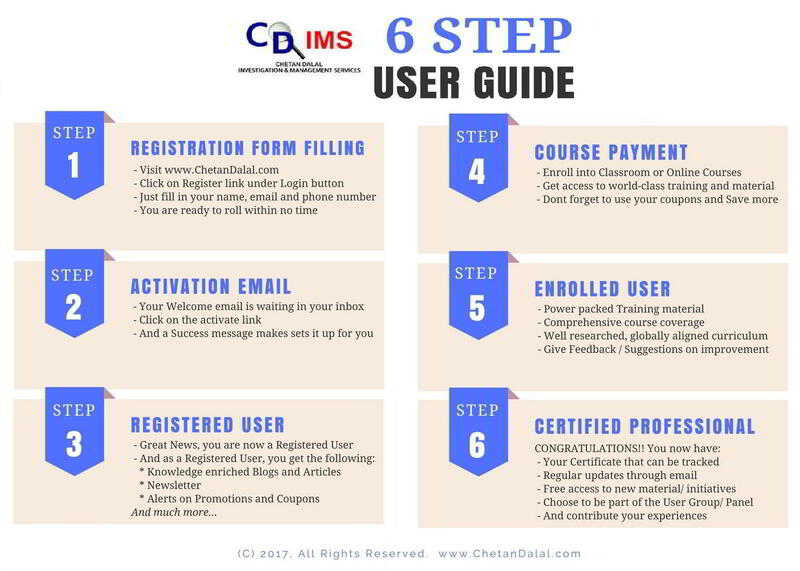 CDIMS reserves all the rights to the copyrights or intellectual property rights in any of the course material or contents distributed / shared / demonstrated during the workshops. The foregoing course material is referred to in GTC as “Course Content”. Any usage of Course Content not in accordance with GTC is forbidden. Without the prior consent of CDIMS, no part of the Course Content may be copied, reproduced, stored or transmitted in any form or by any means including without limitation by means of electronic, mechanical, photocopying, recording or otherwise. The opinions and views expressed in the Course Contents are without prejudice and are based on experience of the authors, research or based on empirical studies. The material is purely for academic consumption and should not be construed as professional advice. The author does not warrant that the views stated shall be effective in each and every case or may give predictable consequences. CDIMS shall not be responsible for the result of any action taken on the basis of this work whether directly or indirectly and for any errors or omissions in the Course Content. CDIMS shall not be responsible for any circumstances arising out of Force Majeure situations. Participant agrees that some of the services and basic amenities like venue, food, beverages, power, etc. are outsourced to reasonable agencies and CDIMS have limited control over them. Therefore, in no event, CDIMS shall be responsible or liable for deficiencies or inadequacies in the aforesaid services. CDIMS shall not be liable for any consequential losses or damages. Notwithstanding anything contained herein, Participant agrees that in any case of whatsoever nature, the CDIMS’s maximum liability shall not exceed the amount paid by the participant to CDIMS as reduced by any amounts refunded by CDIMS. Notwithstanding anything contained herein, the course is accredited and certification is issued by GFSU and hence subject to the rules and procedures of GFSU. The policy includes non-sharing of test results or assessment procedures.Certification depends upon many parameters including attendance, individual tests, group performances, abilities to apply the tutorials to various business situations, etc. Hence type of certification and/or issue of certificates are subject to assessments and evaluations by CDIMS / GFSU. GTC and all workshop / courses shall be governed by the exclusive jurisdiction of theCourts in Mumbai.